We went up there and had an amazing breakfast. Every breakfast comes with bacon, sausage, ham, potatoes, fruits, mushrooms, bread and you can pick from a list that offers either delicious French crêpes, poached eggs on whatever, lox, etc. I picked a buckwheat crêpe with goat cheese, walnuts and maple syrup with two eggs. All this is $15 and it comes with a glass of OJ and unlimited refills of delicious coffee! It was another friend and co-worker of mine who introduced me to this place. He should know that I am really grateful for it. 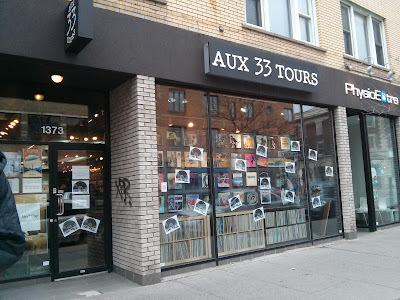 After breakfast, my friend wanted to go check out this store on Mont-Royal avenue called 33 tours. 33 tours means 33 revolutions, which is the number of revolutions a vinyl record makes per minute on a record player. 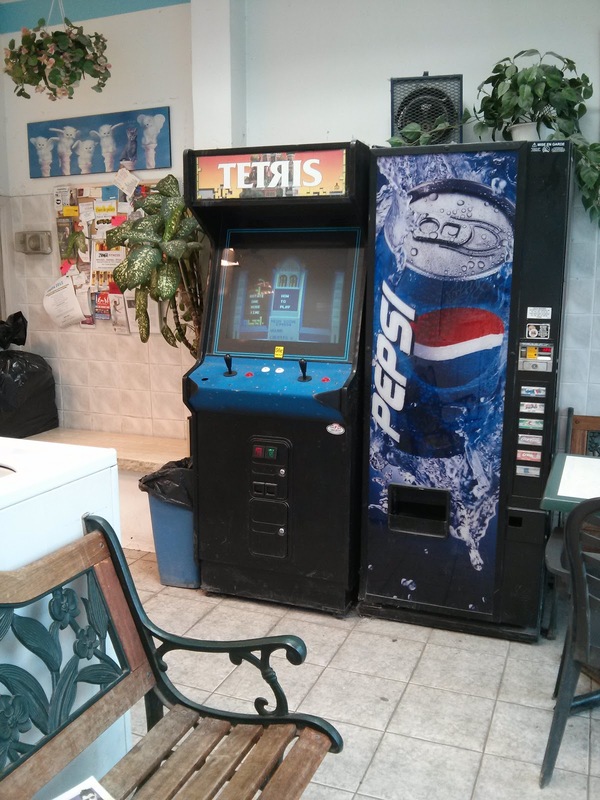 That's right, you guessed it! It's a vinyl record store! 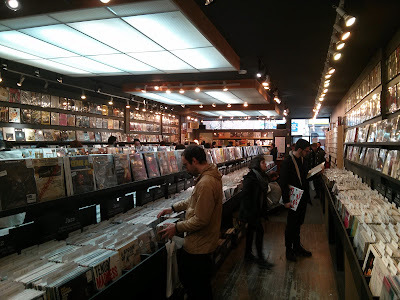 He mentioned that it was record store day and he wanted to check that place out to see if there was anything cool there. On our way there, down Saint-Denis, I noticed a restaurant that I hadn't noticed before. A Mexican taquiera. 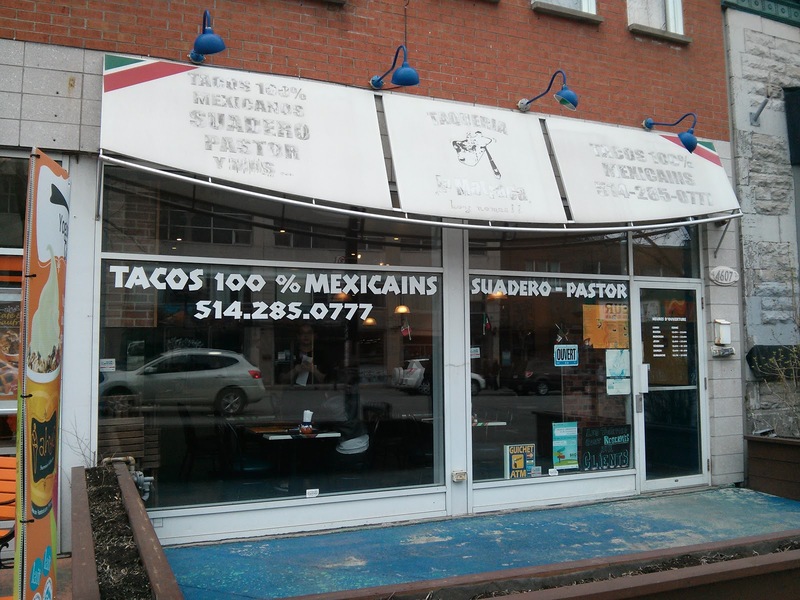 Basically, a Mexican taco restaurant. The front said it was 100% Mexican and they seem to be very serious about the authenticity, even though the restaurant's signs were pretty washed out. But, I'm really curious about the place. After I went to what was probably the best taqueria in the whole world in San Francisco last summer, I've been craving a really good , fresh taco of the same kind. Carlos and Pepe and The 3 Amigos just don't cut it. If this place is as authentic as it claims to be, I'll have to try it out. Stay tuned! When we turned on Mont-Royal avenue, we headed east for a while until we almost reached Papineau and we finally found the record store. We stepped in and while there was a lot of people, it wasn't crowded. My friend and I spent a couple hours just going through vinyls. He pulled out some rare albums from some of his favourite bands such as a U2 album with a cover that had been banned in Canada for a while. My favourite section though had to be the soul/funk section. There were tons of awesome James Brown vinyls, Otis Redding, Curtis Mayfield, Betty Davis, etc. It made me wish I had a turntable at home. Then I remembered how small my apartment is and I said "Nope!". Besides, I enjoy the clear crisp sound of mp3s anyway without all the crackle and pop. Anyway, I had never been in a vinyl record shop before and it was a great experience. We stayed in there for so long though that when we came out it was already past 6pm. We ended up not really buying anything because neither of us have a vinyl record player. Yeah, I know. What was the point of going there in the first place if we don't have turn tables right? Well we still got a chance to see some pretty cool collector's items in there and that was cool. We walked around for a bit and hung out at a video rental store where we'd pick really shady movies and just make fun of them. One of them that made my jaw drop in disbelief is this straight to video movie from The Asylum movie studio called Age of the Hobbits. Hobbits? Yes, Hobbits. Starring the Stargate SG-1 famous Christopher Judge. And the movie has nothing to do with Tolkien or the book The Hobbit. See for yourself. After we had a good laugh checking out all the covers of B-movie grade DVD boxes for explosions and unknown actors, we walked out of the store. 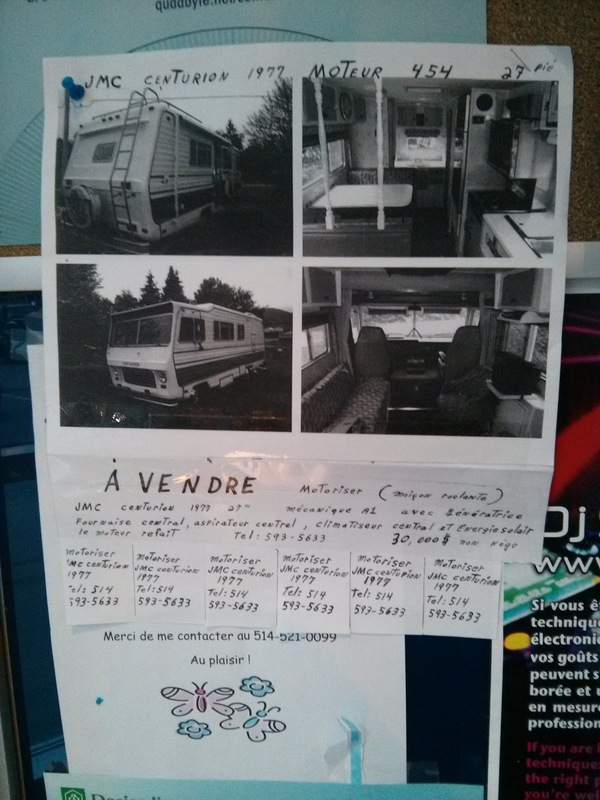 But, not without noticing an ad for a sweet motorized RV. Notice how it says JMC Centurion instead of GMC. That's because, in French, the letter J is pronounced "jee" and the letter G is pronounced "jay". Still, the brand name is written on the damn truck! And trust me on this one, the written French on this ad would make anybody with a literacy level of an elementary third grader cringe. But, damn that's a good lookin' camper! We headed back to my place by bus, went to get some McDice (that's street slang for McDonald's, in case you're not cool enough) for dinner and watched the original spaghetti western that inspired Tarantino's many movies and of course his latest masterpiece: Jango, by Sergio Corbucci, starring Franco Nero. And that, dear readers, is how I spend my last Sunday. If you're into vinyls and never heard of the 33 Tours on Mont-Royal near Papineau, make sure you go take a look. It's a pretty awesome store.